Such were the stated aims put forth by General Bernard Montgomery in the run-up to Operation Goodwood, to date the largest tank battle in the history of the British army. 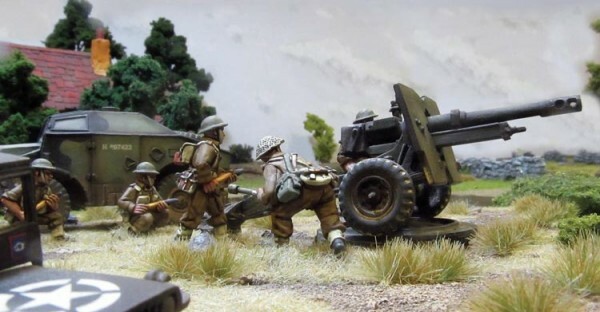 There can be little doubt that, in the course of the operation, Montgomery’s aims were achieved, but not without great cost and not a bit of controversy. On 18 July, 1944, three British armoured divisions rolled out from their bridgehead on the Orne River outside the city of Caen, traversing fields of ripe corn and bypassing quaint Norman hamlets. Awaiting them were German defenders ragged from six weeks’ hard fighting since the D-Day landings but bolstered by formidable reinforcements. 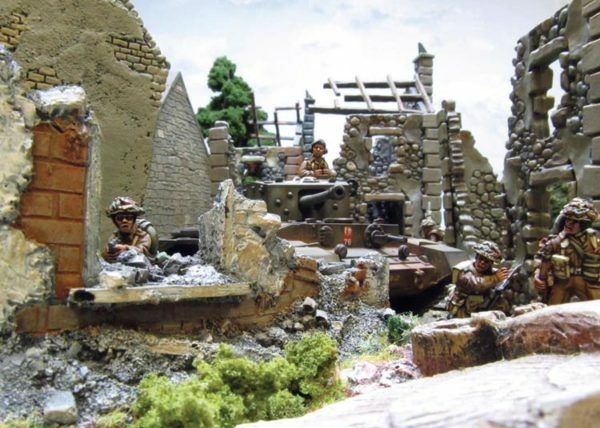 The ensuing fighting would fill the bucolic French countryside with burned-out hulks of tanks, British and German alike, turning the cornfields into tank cemeteries. Operation Goodwood, named for an annual horse-racing event held in West Sussex, arose from the stalled British attempt to take Caen. The city was seen as a linchpin in the Allied plan to force the Germans out of France: Caen would function as a pivot upon which a massive eastward-sweeping offensive could be carried out. But German defense had proven incredibly dogged, and by mid-July only half the city was in British hands. Even worse, a severe manpower shortage meant that for every two British casualties, only one man was available as a replacement. On the other hand, the British army was enjoying a surplus of war machinery; it could afford to lose tanks but not men. 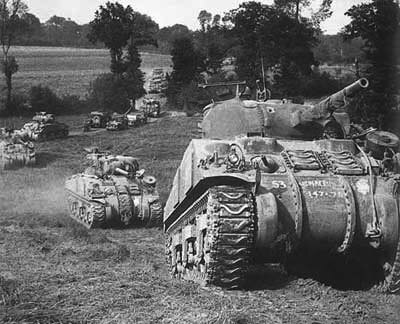 In spite of Montgomery’s preference to launch combined-arms assaults, he gave the go-ahead to use an almost-exclusively tank-based force to encircle Caen and pin down the German units operating in the area, as well as draw in reserves from further afield, thus opening up an opportunity for adjacent American forces to achieve breakthrough. The three British armoured divisions tapped for Goodwood were the 7th, the 11th, and the Guards, all members of VIII Corps. The jump-off point was the Orne bridgehead, a series of three bridges over the Caen Canal and the Orne River east of Caen occupied by elements of the 6th Airborne and the 51st Highland Division. British intelligence had identified remnants of the 16th Luftwaffe Field Division manning the first line of defense south of the Orne, and were aware of at least one other line beyond that. What they weren’t aware of was that that line was fully manned by the famed 21st Panzer Division, currently getting upgraded with Panther tanks and supported by the 503rd Heavy Panzer Division, which now boasted a company of the brand-new “King Tiger” tanks as well as two companies of regular Tigers. What was worse, two SS Panzer Divisions, the 1st (Leibstandarte Adolf Hitler) and the 12th (Hitlerjugend) were in the area, ready to act as mobile reserves. In addition to poor intelligence, there were other problems facing the plans for Goodwood. The jump-off point at the Orne bridgehead was under constant German surveillance from the tall chimneys of the nearby Colombelles steelworks and the Borguebus Ridge. Therefore, preparations and movements in advance of the operation had to be conducted in secrecy at night under radio silence, resulting in much chaos and confusion. The plan called for an attack across a narrow front, only one kilometer wide, denying the British tanks room to maneuver. The narrow bridgehead also restricted artillery placement, meaning that the advancing tanks could only count on concentrated support for a certain distance before being forced to rely on divisional artillery support alone. Nevertheless, things got off to a good start for the British. This was facilitated in part by a massive opening bombardment of the German positions across the entire depth of their defenses. 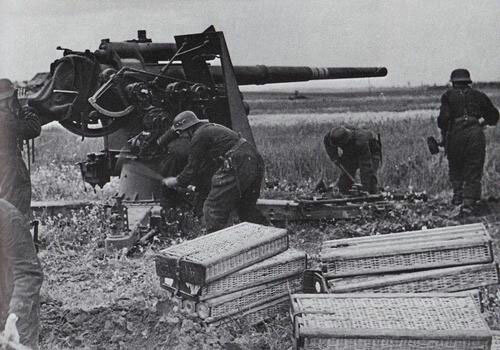 Just after dawn on 18 July, 760 guns began lobbing 300,000 shells into German positions on the far side of the Orne. 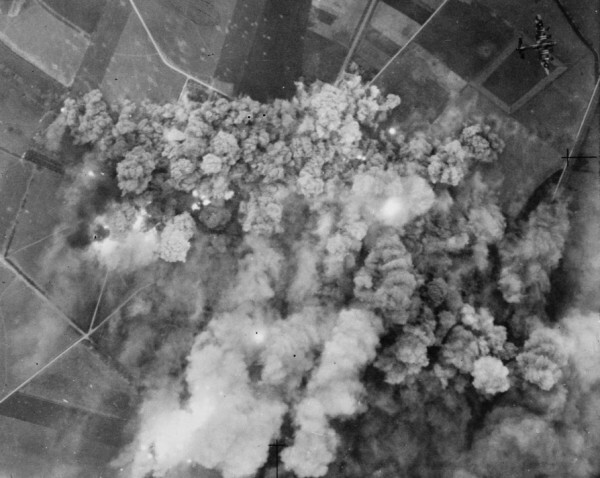 Meanwhile, overhead, waves of British and American heavy bombers, over 2,000 in all, dropped 782 tonnes of bombs in two waves on the heads of the shocked German defenders. Testimonies from survivors speak of men being driven to insanity by the ferocity of the concentrated carpet bombing, of 57-tonne Tigers being completely overturned by the force of the blast waves. As the British divisions began their advance, they met only shell-shocked Germans offering their surrender. 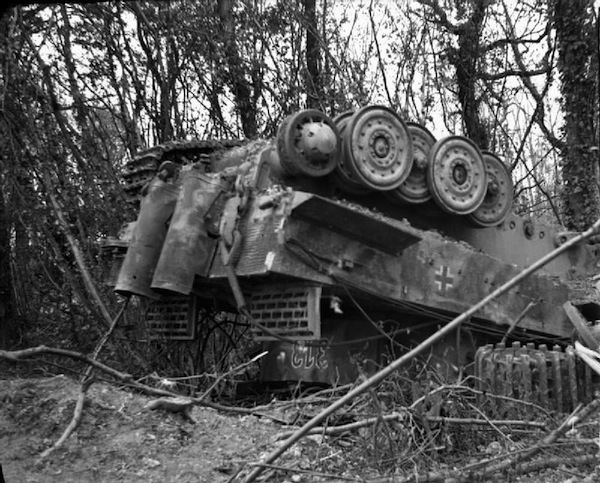 The bombing was so intense that German Tiger Tanks were found flipped-over – much to the relief of the British tankers! This gallant dash did not last long, however. The use of heavy bombers in a tactical capacity was still a new concept, and Goodwood’s planners had overestimated their effectiveness. 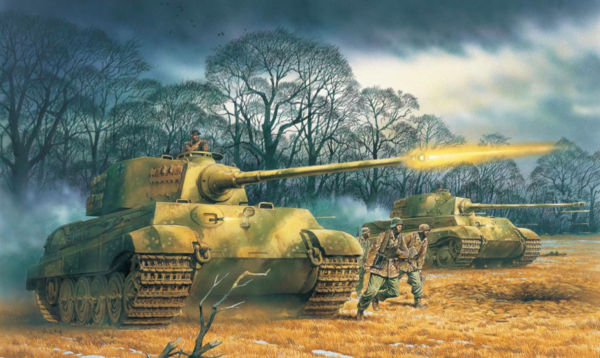 Despite the destruction the bombs had wrought on some units (the 503rd’s 12th Tiger company losing 36 of its 42 tanks, for example) most units had come through in relatively good shape and were soon back manning their defensive positions. Montgomery and the operation’s commander, Lieutenant-General Miles Dempsey, had assumed that the open fields south of Caen would make for “good tank country,” but instead the landscape favored the defending Germans with their long-range, heavy-caliber guns. Worse, the British strategy called for the unsupported tanks to simply bypass German-held towns, but this made the armoured units vulnerable to flanking fire from those strongpoints, particularly at two railway embankments that proved much more serious obstacles than anticipated. The plan had called for the 11th to lead the attack and make south-west for the towns of Bras, Hubert-Folie, Verrières and Fontenay-le-Marmion; for the Guards to take Cagny and Vimont to the south-east. The 7th, coming last, would head due south towards Garrelles-Serqueville. The overall objective was the capture of the Bourguebus Ridge, which commanded the ground south of the Orne. Meanwhile, the II Canadian Corps would assault Caen directly, completing the capture of the city before positioning itself to support any further attacks. As the 7th lingered in the chaotic traffic jam that surrounded the Orne bridgehead, the 11th and the Guards moved out in attack formation, hundreds of tanks driving south. The Fife and Forfar Yeomanry was the first unit to come into contact with elements of the 21st Panzer, and it only took a few minutes to reduce 20 of the Yeomanry’s Shermans to flaming wrecks. Joachim Peiper led multiple local counter-attacks around the village of Soliers, destroying yet more of the Yeomanry’s tanks. By midday on the first day of fighting, the Fife and Forfars had been largely eliminated as an effective force. Fighting across the front was heavy and chaotic. Major Hans von Luck, commanding a Kampfgruppe of panzergrenadiers and desperately organizing an initial defense as the reserve units moved up, had taken a personal hand in blunting the Fife and Forfars’ advance when he drew his pistol on the commander of a Luftwaffe battery of 88mm FLAK cannons and ordered the reluctant man to turn his guns on the British tanks that were at that point streaming past the town of Cagny. Later in the day, the commander of a Sherman from the Irish Guards was the first to encounter one of the newly-arrived King Tigers of the 503rd. When his tank’s gun jammed, he ordered his driver to ram the Tiger, after which the crews of both tanks abandoned their vehicles. The commander then ran to his squadron’s Firefly and directed fire onto the Tiger, blowing it up. By the time darkness fell on the 18th, the 29th Brigade had lost 160 of its 200 tanks, the Guards were down 60 tanks, and the Royal Tank Regiment had lost 40. Significant gains had been made, however. The 7th had at last freed itself from the Orne bridgehead, and many losses were replaced in the night with fresh tanks or field repairs. In the morning, recce units were sent forth to see if the Germans had perhaps withdrawn in the night. 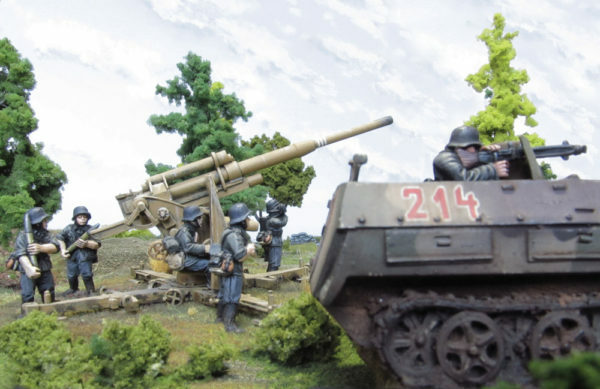 A salvo of fire from dug-in Panthers and Stug assault guns gave a firm answer in the negative. That afternoon, the 11th launched itself once more at the town of Bras, with the 7th following on in its own attacks an hour later. 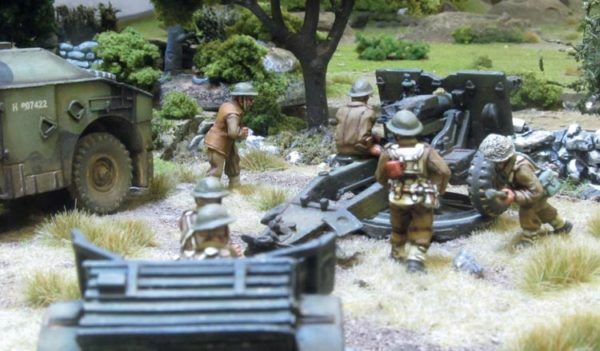 As the afternoon stretched into evening, all three armoured divisions slogged on with grim determination, gradually taking ground in the face of stiff opposition and murderous fire from 75mm and 88mm guns. An afternoon thunderstorm prevented any close air support from bolstering these operations, but there were gains made nevertheless. As rain continued to fall, VIII Corps could claim solid control of the towns of Four, Soliers, Bras, Hubert-Folie, and Le Poirier, and partial control of the Bourguebus Ridge. German counter-attacks were launched on 20 July, but the British were able to consolidate their gains with infantry support. Operation Goodwood was over. Firm casualty figures for both sides are hard to come by, in part due to deliberate distortion by General Montgomery’s enemies within the Allied command both in the immediate aftermath of the battle and after the war ended. It’s safe to say the British suffered at least 1,000 casualties in their armoured divisions and upwards of 1,900 casualties among the Canadians during their own successful capture of Caen; total casualties were perhaps 5,500. Safe estimates of tank losses are at about 300, with half that number counting as totally destroyed, although numbers again range wildly, from 200 to 500. The German forces, meanwhile, lost around 100 tanks. Killed and wounded numbers among the German ranks are unknown, but about 2,000 soldaten (from a probable starting force of 4,800) were taken prisoner during the fighting. 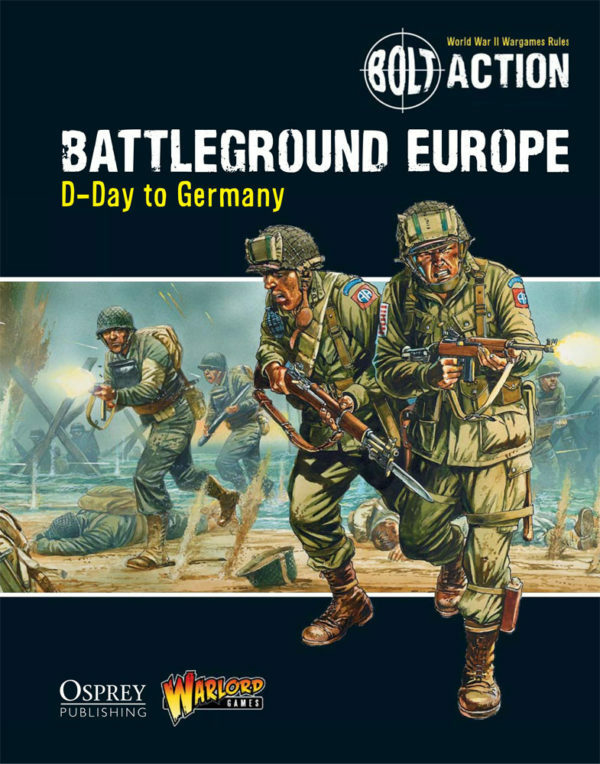 Operation Goodwood failed to achieve a decisive breakthrough, but this was never its primary goal (although there is evidence General Montgomery allowed General Eisenhower to think it was in order to secure better support from the Air Forces). It in fact succeeded in most of its goals. It pinned down several elite German units and drew in reserves from across the front. It destroyed materiel the Germans could little afford to lose. And it set the stage for a successful American breakthrough during Operation Cobra, which started five days after Goodwood’s conclusion. As stated at the top of this article, Goodwood stands as the single biggest tank action in the annals of the British army, a clash between some of the most famous tank units to fight for Britain and Germany alike. It remains a notable and fascinating battle.